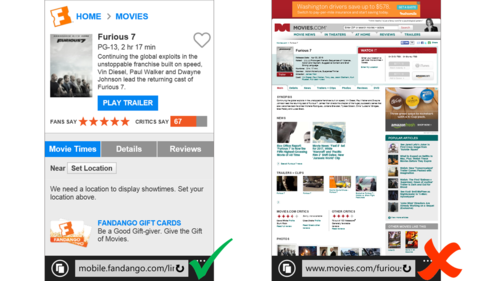 Bing's new ranking algorithm for search results will prioritize sites that have been optimized for mobile, like Fandango, pictured above. The changes, announced Thursday, come less than a month after Google started prioritizing mobile-optimized sites in its search results. Both companies are looking to attract more users by providing a better search experience on smartphones and tablets. Microsoft said it expects to roll out the changes in the coming months. Sites that display well on smaller screens will also be flagged with a new "mobile friendly" tag. The changes don't mean mobile-optimized sites will necessarily appear at the top of results. "You can always expect to see the most relevant results for a search query ranked higher, even if some of them are not mobile friendly," Microsoft said. It considers a variety of elements to decide which sites display best on smartphones and tablets. For example, sites with large navigational elements that are spaced well apart will be prioritized, as well as sites that don't require a lot of zooming and lateral scrolling. Bing will also favor sites with mobile-compatible content. That means pages with Flash content, which doesn't work well on iOS devices, might get demoted. Microsoft highlighted Fandango's mobile site as one that will be prioritized under the changes, more so than Movies.com. The company has also developed a tool to help webmasters assess the mobile friendliness of their sites. It will be made available in a few weeks.